Now that winter is here and the temperatures have dropped, many home owners in the Durham Region, Cobourg and Peterborough areas are seeing icicles hanging from their eavestroughs, or worse, water coming into their house because of ice damming on their roof. There area few main causes of ice damming. Poor insulation in your ceiling, lack of proper ventilation, and lastly gaps between the living space and the attic. All this allows extra heat to go into the attic, warming it up, which causes more snow on your roof to melt. Why is this different than a natural melting of snow on your roof? Because when the snow melts as a result of heat loss from your house, the snow closer to your roof melts, not the stuff on the top layer, So when this snow that is closer to your roof melts, it turns into water and slowly goes down to your eavestrough. Since your eavestrough isn’t heated, this water freezes creating a ridge of ice at the edge of your roof. This ridge prevents melting snow from leaving your roof. That water backs up behind the dam, and can leak into your home causing significant damage. So what immediate action should you take? You’ll need to safely remove the snow from your roof. Be careful not to damage your roof when doing this. Your best bet is to call in a professional roofing contractor to keep you safe and not cause more problems. Your roofing contractor will also be able to tell you if you have any existing problems with your shingles that need to be repaired. Long time, you’ll want to make sure your ceiling is air tight so warm air cannot escape into the attic space. And depending on what’s there, you may consider adding more insulation to your ceiling. You also need to make sure your attic is properly vented. 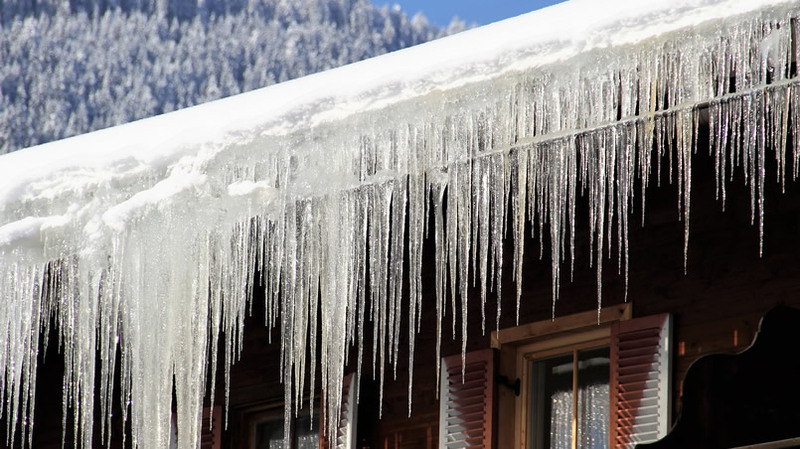 Preventing ice dams and icicles may not always be possible, but taking preventative action is a big step in the right direction. Warning: Any person on a roof during winter months is risking injury and damage to the roof and home. Please contact professionals to carry out this job. If you are in the Durham Region, Cobourg or Peterborough areas, please call or text us at 905-999-5751. We would be happy to come out and look at your roof, assess any damage and provide a free, no obligation quote.